The Rasmussen Reports daily Presidential Tracking Poll for Tuesday shows that 19% of the nation’s voters Strongly Approve of the way that Barack Obama is performing his role as president. Forty-five percent (45%) Strongly Disapprove, giving Obama a Presidential Approval Index rating of -26 (see trends). 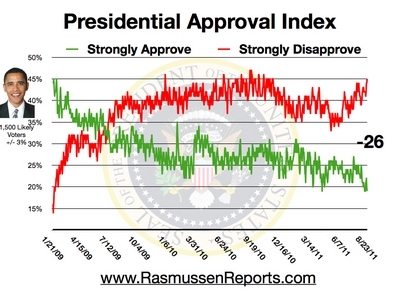 This is the lowest Approval Index rating yet measured for President Obama. The previous low was -24 reached yesterday and also in September 2010. Additionally, the level of Strong Approval matches the lowest yet recorded. By way of comparison, President Bush had ratings near the end of his second term in the minus 30s. As tension continues in Libya, just 12% think the United States should get more involved in Syria. Only 20% think government anti-poverty programs reduce poverty. Seventy-one percent (71%) believe too many people get welfare who should not be getting it. Only 18% believe the opposite is true. Fifty-nine percent (59%) think immigrants who follow the law and enter the United States legally should have to wait three years or more before collecting welfare benefits.